Minnie Smith Feather was born on December 3, 1917. She died on November 6, 2002 in Cherokee, North Carolina. Her father was Joe Smith and her mother was Pearl Maney Smith. Minnie married Jonah Feather about 1933. She was only 16 year old. Jonah was about 29. They had nine children. Minnie was a traditional turtle rattle maker. The traditional turtle rattle that Minnie most probably made are commonly called Turtle Shell Shackles. They are used by the women in Stomp Dance to set the rhythm of the dance. At Stomp Dance there is a “head” man or “caller” and a lead woman who wears the Shell Shackles. The man sets the song and the woman sets the rhythm with the rattling sound from the Shackles. If Nellie made the “old style” shackles they would have been made of small Box or Terrapin turtle shells filled with specifically sought after small stones. The shells filled with stones, typically thirteen on each leg representing the thirteen moons in a year. They are attached to leather leggings and strapped securely to the legs of the women dancers. They are very heavy and many wear a towel under the leggings to keep from chafing the legs and give a little cushion. The stones themselves are supposed to come to the dancer naturally. For instance mine were found before I knew what they were. We were walking in the woods and I stopped at a small pile of stones (not an ant hill) and couldn’t leave them. My relative caught up with me and said: “Do you know what you’ve just found?” I didn’t, so he told me that I was to gather enough of them to fill the turtle shells for my leggings at stomp dance. He said only those who are meant to be “Shell Shakers” find these. They are found in a specific location where an animal while digging a hole in the ground has unearthed them. I can’t tell you more because these things are to come to the Shell Shaker without being sought after. Today many shell shakers fill small milk cans with stones instead of the turtle shell. Although, the women who wear the turtle shell shackles are always in front. Both ways are good, I just feel it’s important to tell of the old ways. At Stomp Dance the singing is in call-and-response form, with a male leader and male chorus. The men begin walking in a single file around the fire in a counterclockwise direction. Women take their places alternately between the men, and children follow. The shell shaker directly behind the male leader sets the rhythm based on the leader's chant, and the rest of the shell shakers pick up and maintain the rhythm. Stomp Dance is usually conducted at sun down and continues until sun rise. 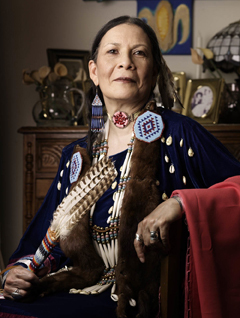 It’s an honor to include Minnie Feather as one of our first Native Baha’is.